about 4 weeks ago I bought my first 3D printer. Through a silly mishap I shot up my first Melzi Board. I had requested the firmware by the seller, but unfortunately he is not willing to cooperate with me. My self-configured "firmware" is now already at a good level, but I do not get to run the display. Here is my hardware configuration as it has already worked with the firmware from the delivery status. I hope someone can help me with the configuration. For display you can use custom config with the pins set. Keys will not work, because we do not support analog keys over resistance. Which display you would recommend to the Board? I would not buy one that is not working with the Board. I guess you had marlin stalled which may support this kind of interface. I'm not a Melzi user so I can not say what works best. I guess with personal config you could get all to work but maybe some have matching connectors. Hopefully sone Melzi user can give you some hints. Unfortunately, my display is still not working. But I have taken a first step to test the display at all. With the Liquid Crystal Library for Arduino it works. And here is the code from the firmware. but some combinations may not work as supposed. which can cause the firmware to freeze. - No sd card - the sd card code is quite large. - No keys attached - The longest part is the menu handling. works, use the ascii charset 0 as fallback. Not the nicest for everything but working! What display type do you use? 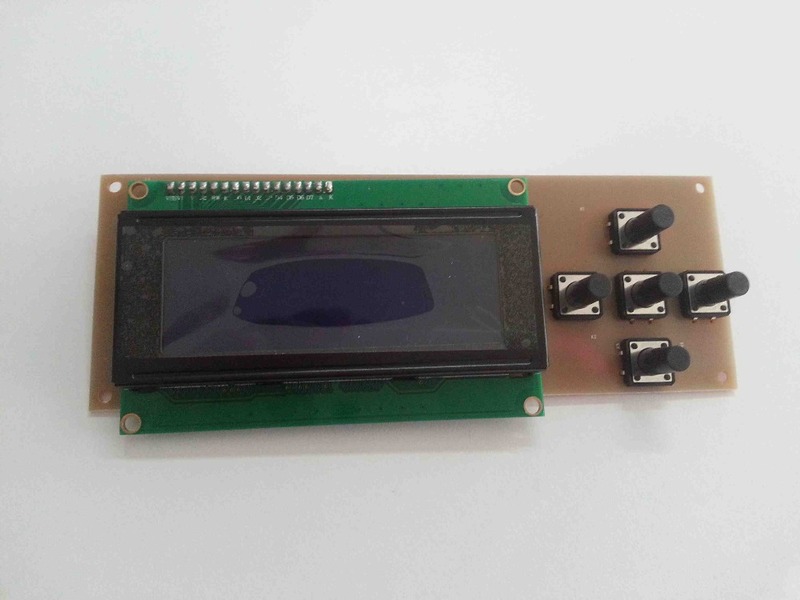 4 = Use the slower LiquiedCrystal library bundled with arduino. IMPORTANT: You need to uncomment the LiquidCrystal include in Repetier.pde for it to work. 0 : PCF8574 or PCF8574A or compatible chips. // Official addresses have a value half as high! // a backlight switched over the I2C. // The adafruit RGB shields enables a light if the bit is not set. Bits 6-8 are used for backlight. 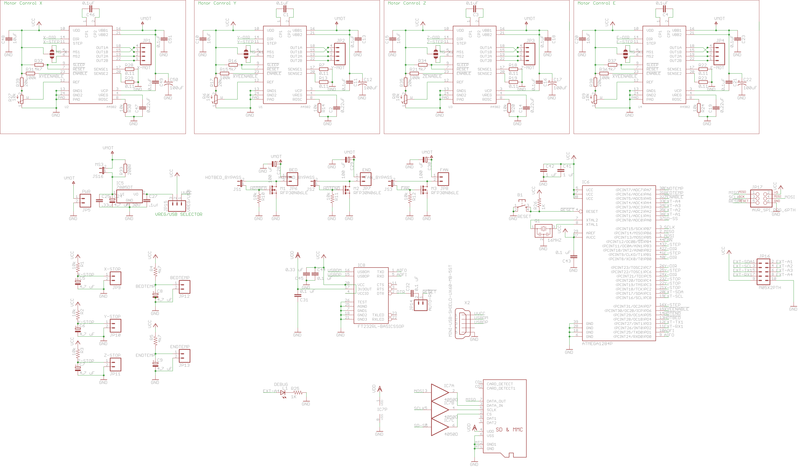 /* How fast should the I2C clock go. The PCF8574 work only with the lowest setting 100000. /** \brief Are some keys connected? /** \brief Is a back key present. If you have menus enabled, you need a method to leave it. If you have a back key, you can always go one level higher. Without a back key, you need to navigate to the back entry in the menu. Setting this value to 1 removes the back entry. /* Then you have the next/previous keys more like up/down keys, it may be more intuitive to change the direction you skip through the menus. If you set it to true, next will go to previous menu instead of the next menu. // Do you have a I2C connected encoder? // Under which address can the key status requested. This is the address of your PCF8574 where the keys are connected. // If you use a MCP23017 the address from display is used also for keys. routines. The predefined macros do the same, just hiding the code behind it. which must be added inside uiInitKeys() and the second ist a testing routine. for testing. If you are in doubt, put it in uiCheckSlowKeys(). fast tests should be put there. at the beginning of ui.h It's best to use the symbol name, in case the value changes. 3. Click encoder, A/B connected to gnd if closed. toggle the _REV with non _REV and toggle pins. If the direction is wrong, toggle _REV with non _REV version. For the push button of the encoder use 1. 4. Click encoder, A/B connected to 5V if closed. For the push button of the encoder use 2. 5. Maxtrix keyboard with 1-4 rows and 1-4 columns. In addition you have to set UI_MATRIX_ACTIONS to match your desired actions. All keys and the buzzer if present must be on a connected to a single PCF8574 chip! As all I2C request take time, they belong all in uiCheckSlowKeys. 6. Click encoder, A/B connected to gnd if closed. init -> not needed, but make sure UI_HAS_I2C_KEY is not commented out. For the push button of the encoder use 7. NOTICE: The polling frequency is limited, so only slow turns are captured correct! There are three kinds of actions. until a new change action is initiated or the action is finished with ok button. closing all othe submenus that were open. // Use these codes for key detect. The main menu will show the pressed action in the lcd display. // after that assign the desired codes. //UI_KEYS_INIT_CLICKENCODER_LOW(33,31); // click encoder on pins 47 and 45. Phase is connected with gnd for signals. // UI_KEYS_INIT_CLICKENCODER_LOW(47,45); // click encoder on pins 47 and 45. Phase is connected with gnd for signals. //UI_KEYS_CLICKENCODER_LOW_REV(33,31); // click encoder on pins 47 and 45. Phase is connected with gnd for signals. // UI_KEYS_CLICKENCODER_LOW_REV(47,45); // click encoder on pins 47 and 45. Phase is connected with gnd for signals. UI_KEYS_I2C_CLICKENCODER_LOW_REV(_BV(2),_BV(0)); // click encoder on pins 0 and 2. Phase is connected with gnd for signals. How can i hide the code in this forum? The vendor is very nice, he has sent me the firmware I asked him because I want to add an inductive sensor for auto-leveling. If you want, I can send it to you by email. Hello hobby16 l also have the same printer but can not get it to work. Will send a private with my mail, would l please send the firmware? Since I have email requests for the source code , I must add that I have examined it in the meantime. I can compile it with Arduino 1.04 but it does NOT contain the code to read the 5 key board: there must be an AnalogRead somewhere but I can't find it. So the seller must have sent me a generic Repetier code without the customization for his board. The hex code in the zip seems good though since I can find the string "Omni v1.4", same as displayed on the LCD. So my auto-leveling mod is not possible for the moment and pending. It would be great if you all ask the vendor to release the real source code and write in AliExpress feedback to dissuade prospective buyers to buy the Hesine printer to pressure the vendor to comply. Cool that would be helpfull , will pm you my e-mail..
Hi, I sent you a PM, I would really like to get a hold of that firmware too if possible. I e-mailed the seller (Hesine @AliExpress) and he sent me the firmware a few days ago. However, there seems to be no display configuration there, but the .hex file supplied is exactly what the printer shipped with. If anyone else has source files with working display configuration, please send it to me. How do the pins "translate" from real pins to pin numbers used in the file? D7 on the HD44780 display seems to go to the pin marked "SDA", which is pin no. 20 on the 1284p, but that does not seem to match up with the numbers @ line 845 and forward in pins.h for the Melzi board. For example, there, HEATER_0_PIN is 13, but on the Melzi schematic, it is number 14. Does not seem to just be a difference of -1 all the time either, SCK_PIN is defined as 7 in pins.h, but is numbered as no.3 on the Melzi 1284p schematic. Am I missing something? Where can I find what hardware pin the pin numbers in uiconfig.h corresponds to? I reverse engineered part of the original firmware from my printer and I think I have found most of the modification they made to it. I modified a 92.5 firmware to include those modification, but like Mixanoid, only the lcd work, no buttons yet. Will keep working on it this weekend, maybe I will finally get it it to work. Today was a good day, I managed to get the buttons workings in 92.5, but the amount of change to the codes is large, there is no simple way to do it, I dont know if the change I made would work on another model of printer, it work on mine, but I had to remove the "alternate leveling" option from the UI because it caused error. If anyone is still interested, I can try to make a guide of some kind to tell you how I did it. Finally got it to work, see modified.txt in .rar file to see what I had to change. Thanks to Mixanoid for the 0.91 source! Confirmed to work on Melzi 2.0 with XI3 from Hesine on Aliexpress. Didn't bother to move over the custom characters and version/vendor strings that the original had. Did you port over the custom leveling code ? I had error when trying to port it, or maybe it was only present on my version of the orignial firmware might not be exatly the same as Mixanoid one ? mmmh, after looking at your version of the firmware, its mutch simpler then the one I got with my machine, it contain none of the custom leveling function and menu entry that mine have, But all the rest seem to be the same. Did you remove those fuction or where they never there to begin with ? Didn't really look for it, but I don't think they were there to begin with. Yeah, its missing all of the commands that where added to my firmware, kinda easier to port without those, and they are not used for my printer anyway so I left them out. Seem like the firmware they sent me is based on this one, but with extra command for auto leveling and some menu option added. Funny thing is, all those are not usefull on my printer, so I dont know why they where included. Removed them and everything is working anyway, so I will just leave them out and be done with it. I made a few test today and was able to add a 3 buttons extention board to the already existing button, added some code to start a homing sequence with the first one and its working, I will probably program the others to preheat the machine without going into the menu. In theory you can add as many buttons as you want if you are so inclined, maybe make a new pcb and change the whole layout of the control panel. Well, really, I could simply reprogram the buttons that are already there to do what I want, the only functions I really use are preheating and homing, I never use the sd card or any of the other menu function since my printer is always connected to my pc. But modifying the codes and the hardware is something I like to do. Thanks a lot for your work Axelsp, you beat me to the finish line!! This forum has pictures of the front and back of the controller as well as a google drive containing some of the printed parts and firmware for the P802M printer. and thank you all for adapting the firmware! Under "mechanics"-->"stepper" both (x and y axis stepper) have the value 85.333 instead of the standard value 80.000. Can anybody explain me the reason for this?
" For belt driven axes (usually x and y), the steps per unit is determined by the number of steps per revolution divided by the idler teeth, divided by the belt pitch (ie the spacing between teeth)"
Its not Often you click on a web site and find your problem near the top of the forum with a solution on the first page. great work every one you've really helped me out! The Pibot and the 5 keys work flawlessly.